Enjoy a thrilling novel by the fireplace or cozy up with a cup of hot cocoa with the help of this exceptionally comforting and stylized wingback armchair from HOMCOM! This accent chair is padded with thick sponge and covered with warm and soft linen, which will last for years. Rare solid oak and dark oxblood leather suit very stylish retro suite in the early Conran habitat style. superb condition. WE ARE HAPPY TO MIX AND MATCH. CRACKING AND MARKS. IF YOU REQUIRE ANY MORE INFO. OAK FRAMED ARMCHAIR MATCHING PAIR ONE HAD ARM RESTS COASTERS ON FEET. Condition is Used. Collection in person only. Retro/ Contemporary Duck Egg Blue Otis Armchair. Linosa Fabric Solid wood oak leg. Originally £699. 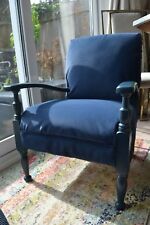 THIS IS A BIG TOP OF THE RANGE CHAIR, WITH WIDE SEAT AND IS VERY COMFORTABLE. We have deep cleaned hand condition waxed and hand polished it from top to bottom.